Fly Fishing Bite Indicators and Sight Indicators and Thingamabobbers. 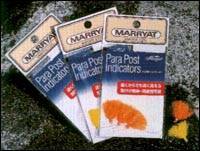 Vast array of fly line indicators for nymph fishing.  Rated the best and most versatile kit available.  Easy to Attach Indicator.  Easy to Adjust Indicator so Nymph is Suspended at Optimal Level.  Easy to Remove - Catch That Rising Rainbow!  Knotless - Don't Lose that Trophy.  No Damage to Leader.  Indicator Yarn Can Be Trimmed to Desired Length. Sample of New Zealand Wool Strike Indicator Yarn. 3 Feet of Perfect Tubing for Strike Indicators! Inspired by western guides the Thingamabobber combines all of the best strike indicator elements in one simple design; highly visible, ultra sensitive, casts well. Easy to attach and adjust yet stays in place. Never sinks and requires no floatant. Use looped or as a straight line connection. Remains in place on small diameter lines. In multi colors. Sizes ½", ¾". 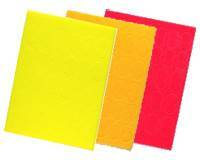 Size Small - 1/4"Medium - 5/16"Large - 7/16"
Colour/Size Fl Red 3/4"Fl Red 1"Yellow 1/2"Yellow 3/4"Yellow 1"
The colour is built in to these virtually weightless pinch-on, closed cell foam indicators, so it will not peel, fade or run like some other similar indicators. The closed cell foam won't get waterlogged like yarn indicators. The aggressive, waterproof adhesive backing will stay put until YOU decide to remove it and leaves minimal residue when removed. Available in three colours. Each sheet contains 32 punch-out indicators in two different sizes and comes complete with full instructions. Tracks easier and floats higher and longer, so you sense more strikes. Bright colours stand out. 12 indicators per pack. Assorted sizes. fluorescent assortment. natural assortment (not shown). Market leading, re-useable indicators. Available in two sizes. Six pack of multi colours. Biostrike floats high. Moulded onto leader when warm, it hardens in cold water and adheres strongly. Tub contains 50% Yellow and 50% Pink. 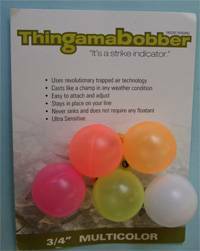 The Thingamabobber is a new design in strike indicators that uses revolutionary trapped air technology. Its design was inspired by western guides in America who use small balloons as strike indicators for their buoyancy and sensitivity. Already a favorite among guides who have tried it, the Thingamabobber combines all of the best strike indicator elements in one simple design. It is buoyant, easy to cast, ultra sensitive, durable, and affordable. 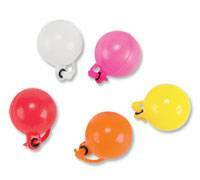 The Thingambobber comes in a variety of colours including glow-in-the-dark and two sizes ½ & ¾ diametres. The ½ are perfect for rivers and the ¾ for stillwaters. Following the amazing success of the "Thingamabobber" this year we have now introduced the "Unibobber". 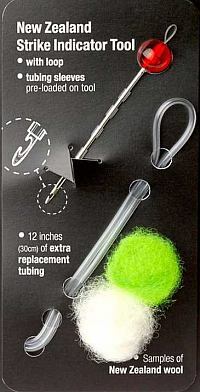 A 1/4" version of the thingamabobber which can be used as an indicator on small rivers and streams but can also be tied into your favourite floating fly patterns. 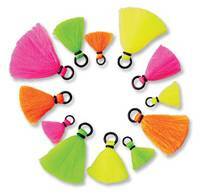 We have used them as parachute posts and booby style eyes in a number of new unibobber flies. The image shows the white version used in a Stimulator/Sedge pattern. FM Strike Indicators.Increase your catch rate substantially by detecting even the slightest take easily. Remember: 'Every Nymph Needs A Pimp!' 30% lighter than other foam indicators. Float high and are easy to see and cast because they are aerodynamically shaped on both ends, reducing wind resistance. Easy to apply and remove and reusable. Each tube package contains 6 fish pimp strike indicators. Use the mini pimps as a sighter when fishing small dry flies or as an in-line indicator when fishing Czech style. Pack of six super visible easily attached Yarn sight indicators. Highly water resistant for superior float. Available in pack of six including 2 of each colour (Black, White, Orange) for different light conditions. Excellent value to double your catch rate! Brain child of Andre Puyans, who's been making strike indicators for years by stripping the coating off old fly lines. 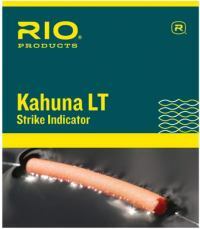 RIO makes the Kahuna LT strike indicators with its ultra floating line technology. To detect a more subtle "take", just slide the indicator on your leader. It's secure and easy to reposition. 18"/ pack. Each packet contains 3, 1ft length of Kahuna LT in Chartreuse, Orange and White. Use a waterproof marker to color the white indicator to any color you like. Can be very easily attached to your line and be shaped to desired size. 3 indicators per pack.